If you were to go strictly on first impressions, Bill Schluter might not be the first person you'd expect to know his way around a crochet hook. You don't see a guy like him crocheting elaborate blankets too often, Bill recently told KAAL-TV. But for the past five years, Bill has been honing his new craft. Doctors at Mayo Clinic suggested the repetitive movements of crocheting might aid in the recovery from the short-term memory loss he suffered as a result of a serious injury. "I had fallen 20 feet from a roof and had a traumatic brain injury," Bill tells the station. Soon he was hooked. In 2014, Bill's new hobby "took a turn" after his grandson was killed in an accident involving a drunk driver just three days before his 18th birthday. "The last thing he had asked me to do was make a blanket for a teacher that was kind of special to him," Bill says. So Bill did. Along with blankets for 35 kids in the community. Each blanket carries a unique color scheme and message. That message is something he hopes they remember "when they go out and choose maybe not to drink," Bill says. 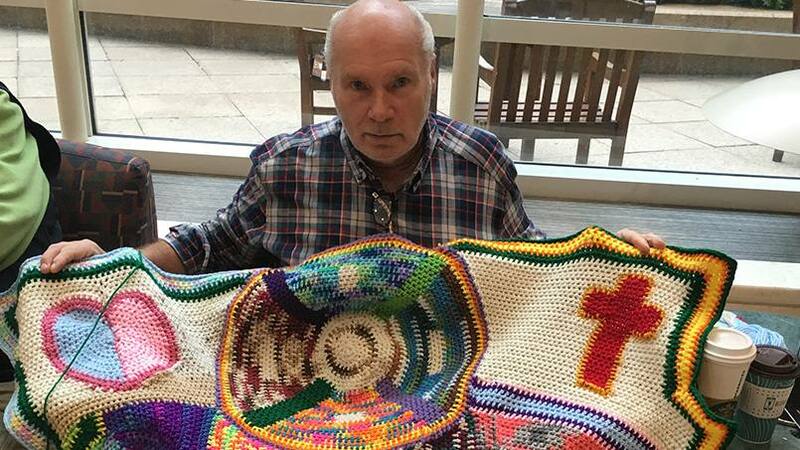 Last March, Bill found another source of inspiration for his blanket making when he was diagnosed with stage 4 colon and rectal cancer. During surgery, doctors at Mayo Clinic also discovered Bill had prostate cancer. "So they took care of that one as well," he tells us. 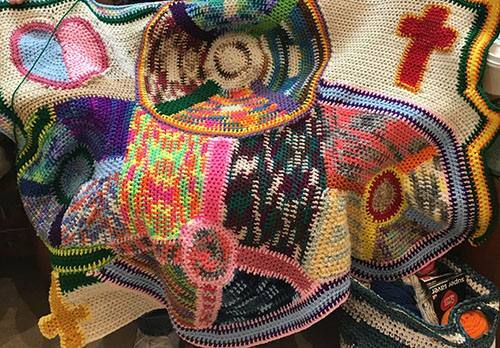 Between chemotherapy and radiation treatments at Mayo, Bill kept on making his blankets — each one, KAAL reports, taking more than a week to complete. In all, Bill has made, and given away, more than 200 blankets over the past three years. Something he says wouldn't have happened had it not been for everything he's been through in that time. "I look at these cancers not as a curse on my life, but as a blessing," he tells the station. Just like the blessing his care team at Mayo Clinic has been, he tells us. "Everyone there has been great," he says. "If you have to be sick, Mayo Clinic is the place to be sick at." Now that he's completed his last round of chemo, Bill no longer fits that description, however. "I am cancer-free I think currently," he tells KAAL-TV. He "feels great," he says, and has had "no side effects at all" from any of his treatments. His medical struggles now behind him, Bill plans to continue making his blankets for as long as he's able and for as long as they can be of comfort to those in need. Like the 30 children at the Ronald McDonald House in Rochester who recently found themselves among the lucky recipients. "I hope they get out of the blankets the knowledge that someone who doesn't know them cares," Bill says. You can show us you care by sharing your comments below. Then, use the social media tools atop this page to share this story with others. Learn more about the Mayo Clinic Cancer Center. This is my dad! I love him so much he is my hero and is an amazing, strong, kind person! I am so blessed to see Gods work in his life! God promises to work all things together for good to those who love him and are called according to His purpose. God never promised everything would be easy. In fact , some things in this broken world that we live in are just unbearable. But I do see the good from all the tragedies that my dad has gone through in this amazing work that my dad does for others and how many peoples lives have been touched!God is faithful to work things out for good! My dad is the best! I love you dad!!! !